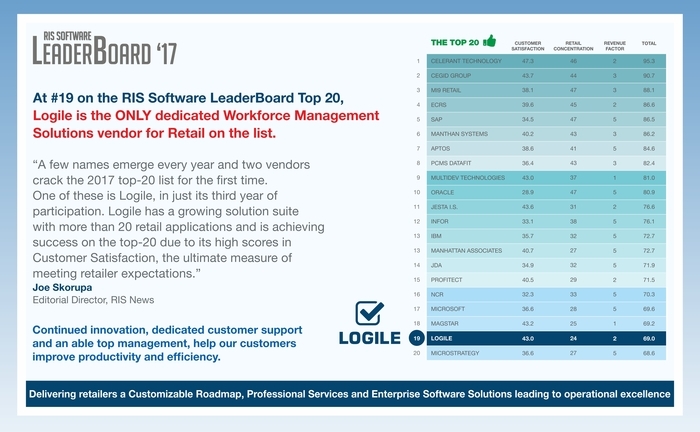 Logile is ranked in the Top 20 for all retail technology solution providers based on over three hundred retailers surveyed in the 2017 Annual RIS Software Leaderboard survey. Among all Grocery Software Vendors, retailers ranked Logile as the #1 solution provider in Customer Satisfaction in ten criteria ranging from Return on Investment (ROI), Total Cost of Ownership (TCO) and Quality of Support and Innovation. It came as no surprise to me that Logile ranked so highly in the RIS Leaderboard survey again this year. I had the opportunity to participate in Logile’s annual users conference, Simplify, last October. The customers at their conference were so impressed with Logile as a solutions partner and this is exactly what we have experienced here at Northgate working with Logile. Tier-one retailers ranked Logile #1 in both Quality of Support & Quality of Service. We are honored that for the third year in a row our customers have voted Logile as the number one workforce management company in a number of areas. 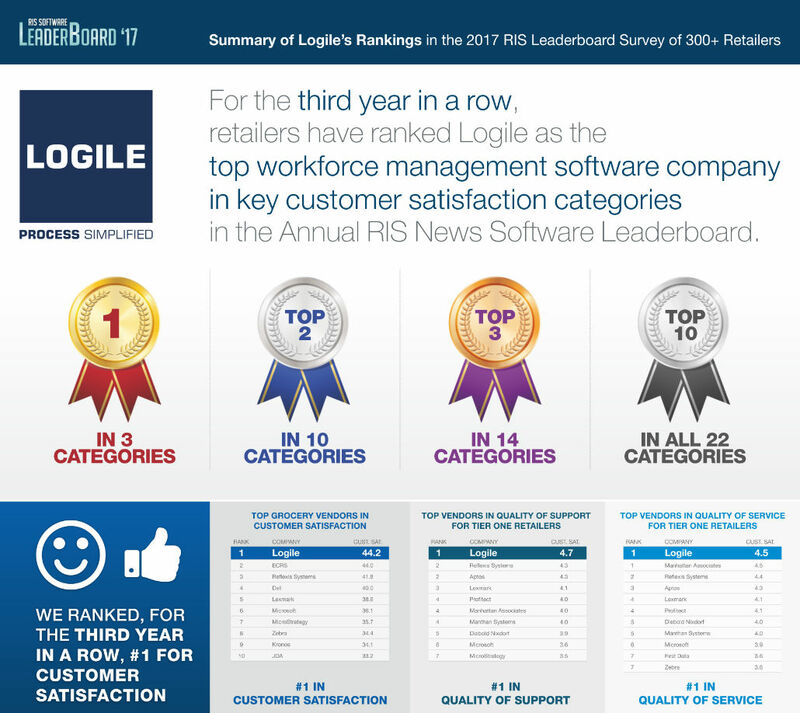 We are extremely excited by Logile’s entry into the RIS Software LeaderBoard Top 20, as the only workforce management company. The RIS LeaderBoard survey provides feedback from retailers speaking highly about Logile and Logile focusing on the right objectives, such as continued development of the best possible solutions with the most innovative support. Logile has a very aggressive development plan for the next three years and we will continue to grow our offerings and services to allow our customers to achieve their objectives in the extremely competitive retail market. Purna MishraFounder, President and Chief Executive Officer, Logile Inc.
Logile, Inc., a Texas based company, was incorporated in 2005 and remains privately held with software development and quality assurance teams located in the United States, the United Kingdom, the European Union, China, and India and industrial engineers and seasoned retail consulting teams located across the United States and Latin America. Logile provides Workforce Management and Execution Compliance Solutions encompassing industrial engineering consulting services and planning and execution software applications that empower more than three million retail employees across six continents in 18,000+ stores to optimize efficiency, improve customer service, and increase profitability. RIS News is the essential source of information for retail executives, helping them connect with relevant content, engage with their peers and find best-in-class business solutions and strategies to make smarter IT and business decisions. It helps executive adapt to change, stay competitive and maximize profits and productivity. No other media organization in retail truly engages with the entire retail business and technology community like RIS News. RIS continues to nurture and grow its relationship and engagement with this community around these five major discussion areas: Store Systems, Analytics, Customer Engagement, Digital Commerce, Merchandising/Supply Chain. For more information about RIS, please contact Joe Skorupa, Editor-in-Chief of RIS News at jskorupa@edgellmail.com. Choosing a Software Company or a Software Solutions Partner Centralized Scheduling: Is it Right for Your Organization?